We went to visit the Botanic Gardens yesterday. It is free to get in and there is lot’s to see. I would definatley reccomend going! There is an Orchird Garden, within the Botanic Gardens, which costs $5 spd to get in. That is also well worth visiting. The park is open from 5.00am till Midnight, and the Orchird garden is open from 7.00am till 7.00pm. It was nice to get out of the city for the day. 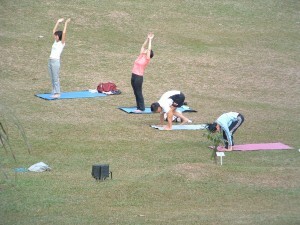 It is a very popular park for jogging and cycling. We saw some people doing meditation and also Yoga. We took quite a few photos, to have a look at them just go to the gallery. We leave Singapore tommorow afternoon, to fly to Bali. We plan on staying in Bali for 2 weeks, then we fly to Bangkok. We have enjoyed being in Singapore, however after a few days here, we are ready to move on. Things are very expensive, compared to the rest of Asia, and there are so many shops, but as a backpacker this is not what you want! 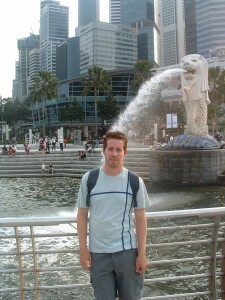 There are a few things that I would definatley reccomend, when coming to Singapore. Science Center- Costs $6 each. You should spend a whole day there, as there is too much to fit in, in just a couple of hours. Sentosa Island- Costs $3 to get the Sentosa Express. That also gives you addmission to the Island. There are lot’s of things for you to do on the Island, like, rides, 4D Cinema, Cable cars, Luge ride, rollercoasters, beaches ect. We went on the Cable car and Luge Ride, which I was unsure about doing at first, but really enjoyed it! This costs $11 spd each, for the cable car and Luge. There is also a bridge you can cross which takes you to the most southern point of continental Asia. 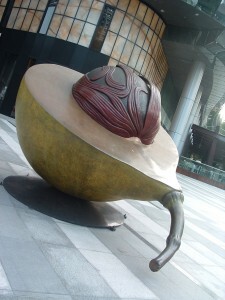 Shopping Centers- There are many shopping centers, mostly centered around Orchard Road. Even if you are not wanting to buy anything, it is worth visiting to see the designs of each building. 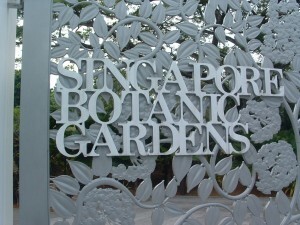 Botanic Gardens- of which I’ve already mentioned. This is a good day away from the city, and doesn’t cost a penny! 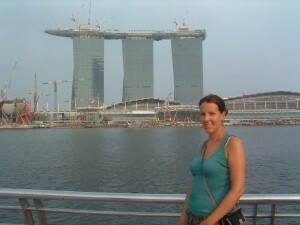 Marina Bay- This is where the famous Merlion is. There is also a new theatre there, called Esplande where you can see performances daily. Singapore is such a modern city. Everything is in such order and everyone seems to follow rules with no question. This is the complete opposite to India! It is taking us some time to adjust oursleves, and to realise that we no longer have to push and shove when getting onto public transport. The people are so polite. It’s like everyone has gone through some kind of training that they have to conform to! It is a great city. There seems to be a lot going on for young people! There is a lot going on for young arists. We watched some local people performing today in a Theatre. Also regular performances on open air stages seem to be happening every night this week. It is nice seeing people express themselves. Sometimes it’s just about giving peeople the opportunity! This week in Singapore there are going to be regular performances from a company called ‘Noise Singapore’. I love to see unsigned bands and musicians performing. There is something very raw about it. Today we looked around the city. There are so many shopping centers. Every 5 minutes you walk and there is a new shopping center. Shame we don’t have loads of money and space in our bags, to go shopping! The shopping centers are quite impressive! There is a lot of thought gone into the layouts and design of each building:) There are also millions of places to eat too! There is a wide variety of food, from sushi, thai, indian, fast food, chinese ect! It’s hard when you don’t eat fish though, as every meal seems to have fish in! Paul is very happy that McDonals have beef burgers here! He missed them in India! Although he has promised me that he won’t eat McDonalds every day! Here’s some pictures from today! We will be in Singapore till Saturday 13th March. Then we fly to Bali for two weeks. We arrived in Singapore yesterday evening at 6pm, Singapore time. We are now 8 hours ahead of GMT. We set of from Chennai at 3am in the morning, local time. So we decided to go to the airport after checking out of our hotel in the afternoon, to save us carrying our bags around all day! The problem was we didn’t know they wouldn’t let us in to the airport. Unlike most airports, you are not allowed into the airport until 3 hours before your flight! So we had to go back into the city. We found a left luggage place in the airport to leave our bags for the day. Our flight over to Singapore stopped by Hong Kong first. We flew with Cathay Pacific. Which I was very impressed with! Their service was fantastic, and the food was very good quality! Hong Kong airport was quite impressive! A massive contrast after coming from India! We had a 2 hour stop over in Hong Kong airport, then left for Singapore. Arriving in Singapore was completley the opposite of our experience arriving in India! When we arrived in Delhi, we were greeted by touts trying to charge us more than the local price for a taxi. When we arrived in Singapore, we were greeted by locals and airport workers, who were kindly directing us to the MRT (Train into the city). They even went as far as to come with us to show us how to select the ticket and to show us exactly where to get off! There was also a tourist information with leaflets and maps! You may think this sounds like an obvious thing to have, but it has been a while since we’ve seen a place so organised! I am glad for both types of experiences however! Singapore looks like a really organised and clean city. Which will be a breathe of fresh air, for a while. However, I know eventually, we will miss the uniqueness of India! India is something you just have to see for yourself! We are staying in a hostel called, footprints. 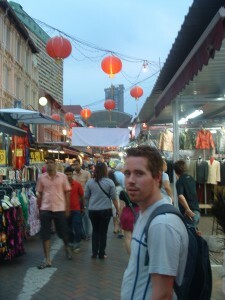 Which funilly enough is in a place called ‘Little India’. Just when we thought we had left India behind, we are right back here! The hostel we are staying in is lovely, really clean and great facillities! We have WiFi at last! There are also washing machines and dryers on each floor! There is a lovely sitting area and cafe down stairs and breakfast is served every morning. Although we missed it this morning, because we were too tired! I will let you know more about Singapore later! We are off to explore!